Jakarta (ANTARA News) – The government of Indonesia, through the Ministry of Foreign Affairs, is ready and will continue to market and promote the nations tourism potential, including that of West Nusa Tenggara (NTB) Province. NTB comprises several islands, including Sumbawa in the north and Lombok in the west, which offer several holiday destinations to tourists from across the world. Lombok is famous for its scenic beaches and underwater beauty that enable NTB to offer a whole lot more. Apart from the beaches, the mountainous areas of the province are a beacon for adventure enthusiasts, with Mount Rinjani, the second-highest volcano in Indonesia, famous for its caldera situated to the west of the summit. Hence, Foreign Affairs Minister Retno Marsudi has expressed readiness to market and promote the tourism potential of NTB abroad. “Speaking of NTB, it certainly has beautiful natural scenery, combined with a highly religious society,” Marsudi stated in the provincial city of Mataram on Friday. The foreign affairs minister reiterated her readiness to promote NTBs tourism potential abroad, since she opined that the provinces blend of natural beauty and religion had drawn accolades, as was apparent by the fact that the area was adjudged the best Halal tourist destination in the world. Lombok Island in NTB has been recognized as the worlds best Halal tourism and honeymoon destination, a feat that should have led to an increase in Halal certification for hotels and restaurants in the province. Hence, hotels and restaurants in the province should immediately obtain Halal certification that would help them attract tourists from Middle Eastern and other Muslim countries. Halal certificates are issued by the Indonesian Ulema Council (MUI), the countrys highest authority on Islamic affairs, in cooperation with the Food, Drug and Cosmetics Assessment Agency (LPPOM) and the Department of Industry and Trade. LPPOM is an institution under MUI responsible for conducting Halal examination, audit, and assessment. Currently, acquiring a Halal certification is optional, but Indonesian lawmakers are trying to push for the enactment of a Halal Product Protection Bill which, if passed by the House of Representatives, will make it mandatory to ensure that all products are Halal certified before they reach the market. Moreover, currently, the Mandalika Special Economic Zone (SEZ) in NTB holds immense potential and is being developed as a new tourist destination in the Central Lombok District. The development of the Mandalika SEZ is being currently accelerated to boost economic growth in Indonesia, particularly in the province of NTB. Hence, the Indonesian government will continue to speed up the development of the Mandalika SEZ to become one of the leading tourism destinations in the surrounding areas, such as the island resort of Bali and NTBs Komodo Island. Vice President Jusuf Kalla had once remarked that the local communities should be trained in hospitality skills, such as service with a smile and also about maintaining cleanliness. Kalla noted that tourist attractions in various regions in the country had drawn several foreign tourists, but innovation was the key to attracting more investment. Tourism is the easiest means of attracting investment, as it does not require huge capital, Kalla pointed out, adding that the main capital given freely by God is the beautiful natural landscape and the hospitable behavior of the residents around the tourism site. Hence, the vice president noted that the best approach to develop tourism is to bring about innovation as he believes there are several places in the country that are considered usual and mediocre but are of immense interest to foreigners. Several hotels are being constructed at the Mandalika SEZ by PT Indonesia Tourism Development Corporation (ITDC), which is a state-owned enterprise in the field of tourism. In addition to building hotels, ITDC will also build the basic infrastructure needed by hotels to support their operations, such as the need for clean water that will be met by utilizing seawater through a desalination process. This task is being carried out by establishing partnership with EBD Bauer, one of the US companies engaged in the desalination of seawater into fresh water. Other infrastructure in the process of being set up include a solar power plant and gas power plants for hotels in the Mandalika SEZ that will not use electrical energy from the State Electricity Company (PLN). 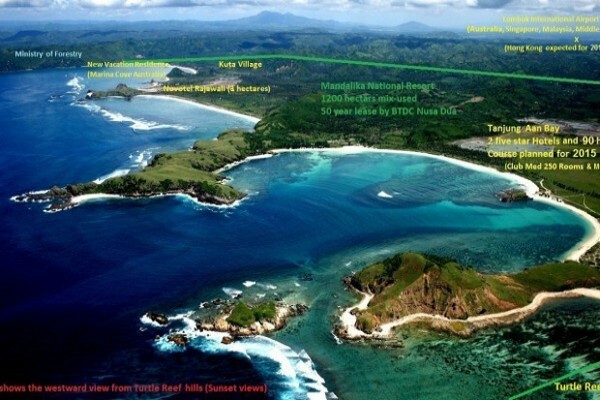 Thus, some 20 star-rated hotels will be built in the Mandalika SEZ within two decades. For the first stage, the company will build four five-star hotels, and it has prepared the basic infrastructure. ITDC is also building the Tourism College, which will help to train human resources needed by hotels. Following completion, the SEZ of Mandalika resort will be able to employ more than 58 thousand workers. During the construction period, the number of workers is forecast to increase by two to three folds and will help to reduce the flow of Indonesian workers abroad.